Piqua shortstop Reagan Toopes takes a throw at second base as a Lehman Catholic runner slides in. 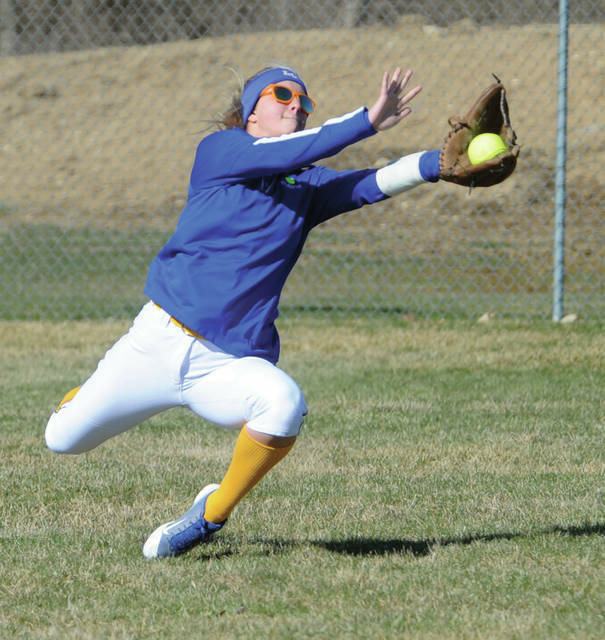 Lehman Catholic third baseman Grace Brandt field the ball against Piqua Tuesday. Piqua pitcher Mariah Blankenship fires a strike against Lehman Catholic Tuesday. Piqua’s Chaia Sowers bowls over Lehman Catholic’s Abby Schutt after Schutt stepped into the base path. 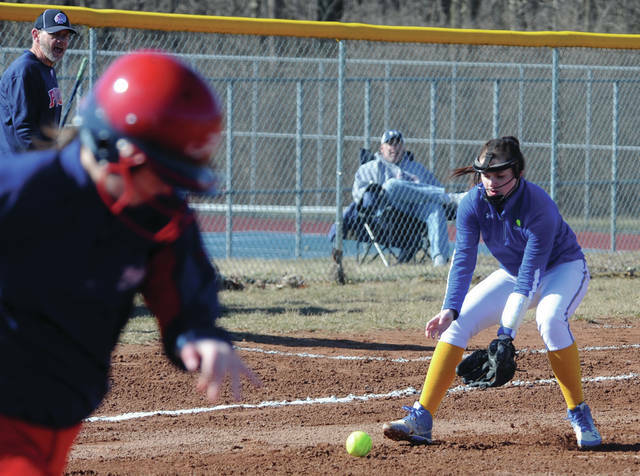 The Piqua softball team and first-year coach Greg Campbell opened the season with an 8-1 win over Lehman Catholic Tuesday. 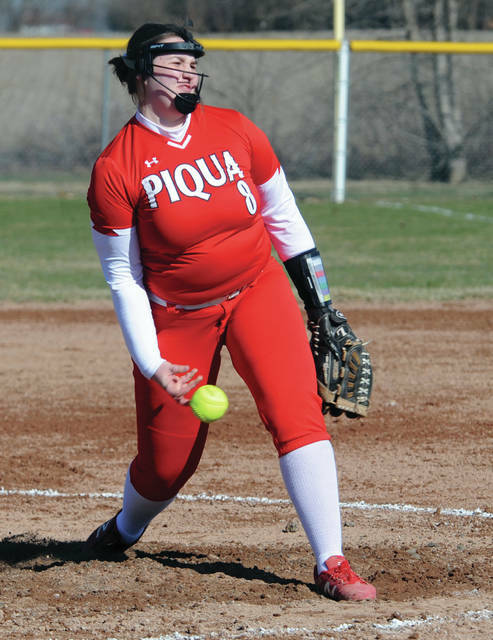 Piqua got off to a fast start, with four runs in the first and second innings and Mariah Blankenship handled things on the mound. 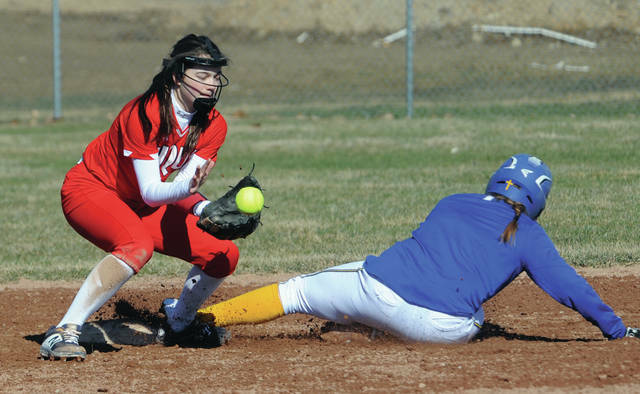 Blankenhsip pitched a four-hitter, with eight strikeouts and the Lehman run was unearned. The Anderson family provided plenty of pop in their bats for Piqua. Hannah Anderson was 3-for-4 with two doubles, while Kenzi Anderson was 2-for-4 with two doubles and two RBIs. Kathy Young was 2-for-4 and Kamy Trissell had two RBIs. Annie Stiver pitched for Lehman, striking out six and walking five. Hope Anthony had a double. The Indians were playing at Arcanum Wednesday and will host Urbana today. 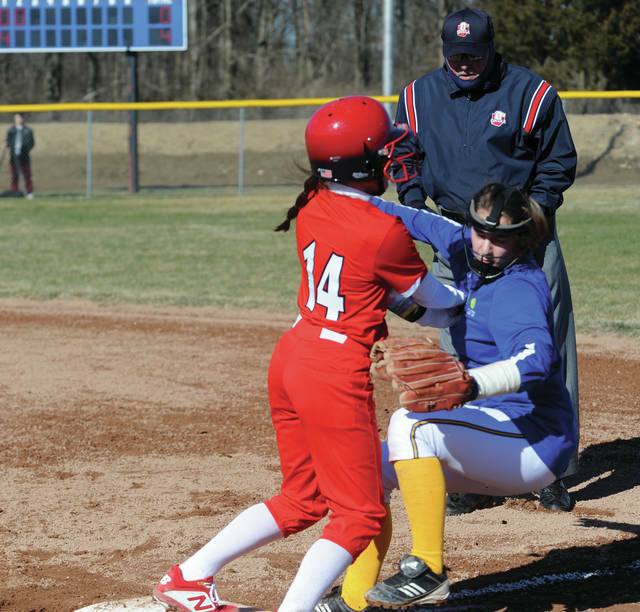 COVINGTON — The Covington softball team opened the season with a 7-3 win over Franklin Monroe Tuesday. After jumping out to a 3-0 lead after one inning of play, Covington found itself in a battled as Franklin Monroe scored a pair of runs in the third and then had bases loaded with no outs in the top of the fifth. But junior hurler Kenzie Long was able to pitch her team out of the jam by recording outs on three straight batters to preserve the 3-2 lead. Covington followed by scoring a run in the bottom of the fifth and then Franklin Monroe cut the margin to 4-3 with a run of its own in the top of the sixth, which likely would have been more if it wasn’t for a great play by center fielder Makenna Gostomsky, who was able to chase down a fly ball and make a perfect throw to the plate to hold a Lady Jet runner at third. Gostomsky would then put the game away with one swing of the bat in the bottom of the sixth on a two-run home run to dead center field. Covington followed with an insurance run to make the score 7-3 entering the seventh inning. In the top of the seventh, Kenzie Long struck out the first batter and then forced a pop up to right field that was hauled in by Krystal Latimer. Then after a single kept Franklin Monroe alive, Long recorded a strikeout to end matters. Long pitched a nine-hitter, striking out eight and walking two. Gostomsky led the Bucc hitters, going 3-for-4 with the home run and two RBIs. Long helped out her cause at the plate by connecting on two doubles and driving in two runs. Covington plays at Mississinawa Valley Thursday.